But lately, we have eaten it so often. As the main course. With a side of grilled veggies and some raw ones too. There are so many available during the summer. Yum. But did you know that Quinoa is an ancient South American grain, dating back over 5,000 years? (www.quinoa.net) Yeah it was pretty important back then. And it has more protein than any other grain. Good stuff. Bring water, broth, and quinoa to a boil. Cover and reduce to a simmer for 10-15 minutes or until all liquid is absorbed. 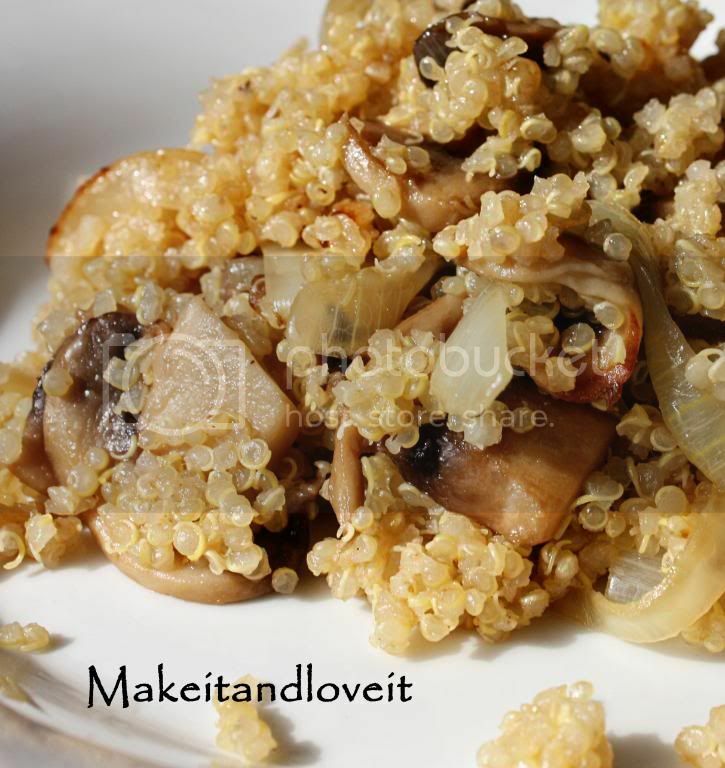 While the quinoa is cooking, sautee your mushrooms, onions, and garlic in some butter over medium heat,until soft. Turn down to low and add the cooked quinoa and combine flavors for a few minutes. Add salt and pepper to taste. Thanks for sharing! I love quinoa! That sounds delicious! I'm thinking now and don't remember ever tasting quinoa.. yet. Really have to try it someday. Can you compare it to couscous? That looks really good. 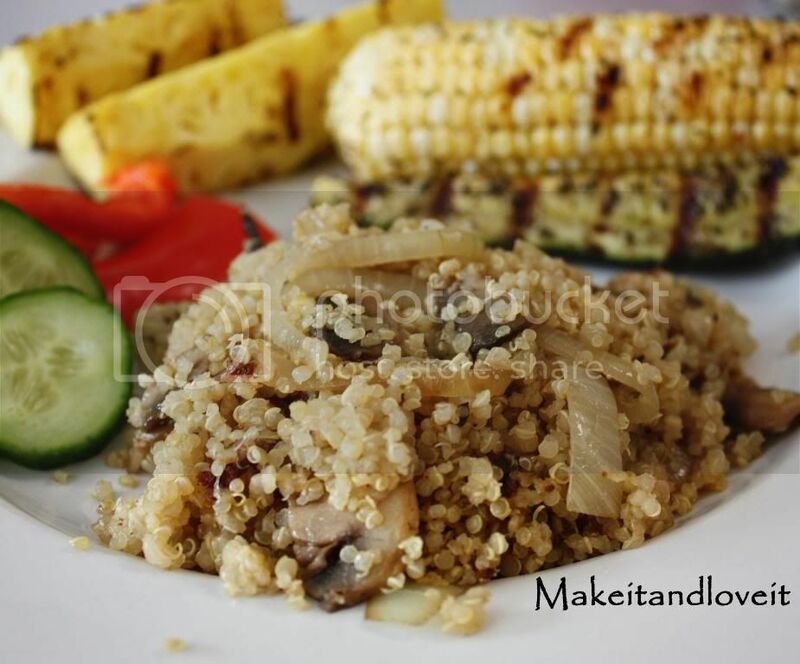 I love Quinoa, I usually make a southwest style quinoa, but I will give this a try! I love Quinoa and am always looking for fun new recipes. This looks delicious, can't wait to try it! Thanks for sharing and for all of your really cute ideas! Thank you so much for this recipe! I bought some after reading about it in "You are what you Eat", but honestly, didn't know how to prepare it so that it would be appetizing to my family. I'm excited to try this- Thanks! I Just found Quinoa and love it! Love it with cranberries and feta. Yum! Looks good..I am a wanna be health nut lol..And have heard of it..Actually I have picked it up in the store but 7 bucks for a little bag was hard to swallow not knowing if the kiddos would eat it or not..So with this post I will have to try the recipe out. Thanks for the info!!! I love quinoa. I love the texture of it, all small and grainy. It's great. Thanks for posting the recipe. Sometimes it's hard to come up with recipes for things that aren't very common. I recently tried Quinoa for the first time, there is a recipe in one of my food magazine for Chicken Balti one pot and it used Quinoa instead of rice, and it was so scummy! you can do lots with it. Hey you, love this recipe ;) We'll have to get together and cook some more. hmmm…I tried quinoa the day before you posted this. My sister just sauteed it in olive oil. I wasn't a fan, but I'll try this recipe. Hers looked different too…like it had little white worms or something. My husband and I, literally, just bought quinoa the other day and then you posted this recipe! I just made it and it was DEELISHUS!! I served it with a seared tuna steak and baked acorn squash. I felt like a fancy shmancy chef! Thanks for the recipe! Hello! Just dropping by to tell you that I made a little mention of you in my blog post today about your orange creme dessert. (I hope thats ok!) I can't wait to try it! Hope you have a wonderful day! Thanks Whitni, I'll have to go check it out! This is unrelated to this topic… but I just found these sweet little roses and thought I'd pass this link along. They are so easy to make and like yo-yo's; can go on everything and look absolutely lovely! wow! I have bee wanting to try this, but wasn't really sure how to make it, thanks for the recipe! I've heard so many good things about quinoa. Thanks for the recipe. i love quinoa!!! i am excited to try this recipe! I have been eyeballing the quinoa at costco and because of your post, I just bought some! Hoping my kids will love it like yours do. Thanks! Thanks for sharing! I love this idea for a main dish. Your site is my new favorite! Try this one, i made it once, it tasted great, i'm sure you will love it too.. I'm compiling quinoa recipes (just tried it for the first time a week or so ago) and this sounds terrific! We're trying to eat less meat, so this is a good protein source. I made a yummy veggie curry and served it over the quinoa…delish! I LOVE quinoa! Have you ever tried black bean quinoa salad? I'd be happy to pass along the recipe if you'd like it. It's delish!